168 pages | 18 B/W Illus. 4. 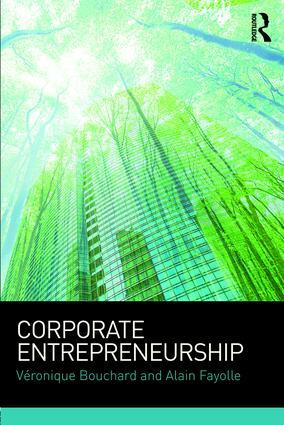 Corporate Entrepreneurship: A Secific Process? Véronique Bouchard is Professor of Strategy and Organisation. She joined emlyon business school in 2000 after a previous career in strategy consulting. Her research focuses on Corporate Entrepreneurship. She has published numerous articles in international and French-speaking journals. Her last book, Intrapreneuriat, Innovation et Croissance: Entreprendre dans l’Entreprise, won the 2010 "Prix du Livre d’Entrepreneuriat". Alain Fayolle is Professor of Entrepreneurship and Director of the Entrepreneurship Research Centre at emlyon business school. He has published 35 books and over 150 articles in leading journals. He chaired the Academy of Management Entrepreneurship Division in 2016–2017 and acts as an expert for governments and international institutions. He was granted the 2013 European Entrepreneurship Education Award.